Every option is available for packaging and presenting custom and bulk USB drives. Once they are designed and loaded with your data, we offer a selection of packaging that meets your budget and matches your USB drive. Options range from clamshell cases to pouches and leather-like finished boxes. This case allows for ultimate branding and information. With multiple configurations and inserts available, Flash Pacs provide graphics inside and out. The collection of bright, sleek, sturdy and elegant USB boxes add polish and finish to digital storage duplication projects. 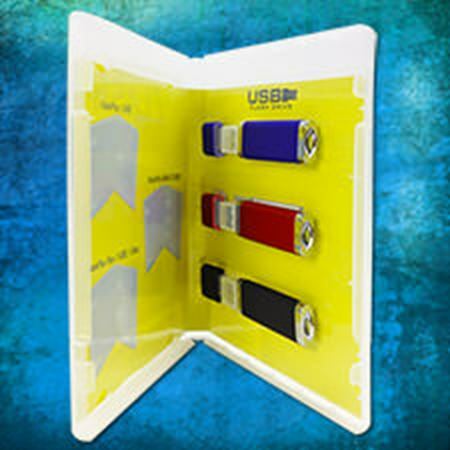 Bring customized USB flash drives to retail shelves with clear, brandable clamshell casings that bring shine to USBs. Wrap up USB flash drives in plush pouches and protective sleeves. Available in an array of styles and materials.